function as an intron splicing assembly factor. U4-snRNA by intermolecular hydrogen bonding. tics of both group II and spliceosomal introns. U4-snRNA via intermolecular h ydrogen bonding [12-1 6]. abundance of new sequences now available for analysis. species were included in our study. and the resulting alignment was further refined by eye. matchi n g re sidues. 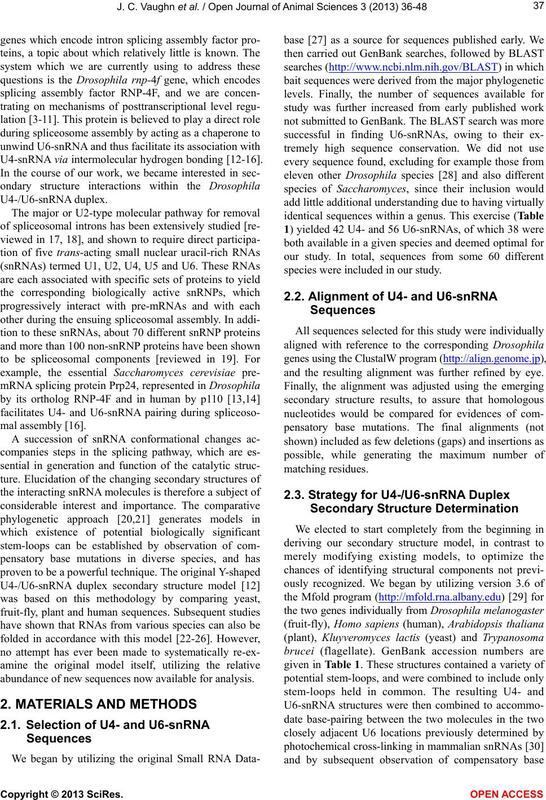 Table l. U4 and U6 RNA sequences utilized in this study. 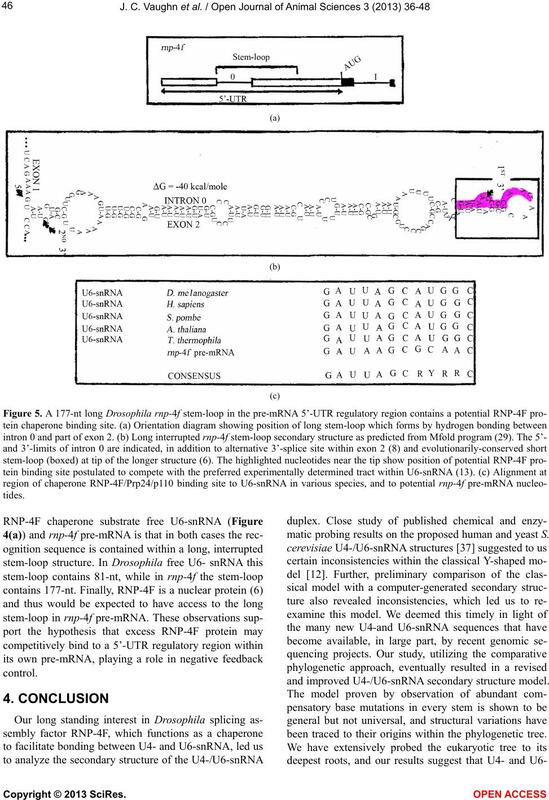 cleotides are base-paired in our U4-/U6-snRNA model. which is indicated by a heavy vertical overlay. observation of numerous compensatory base mutations. lengths (compare D. melanogaster in Figure 1 with T.
general model. 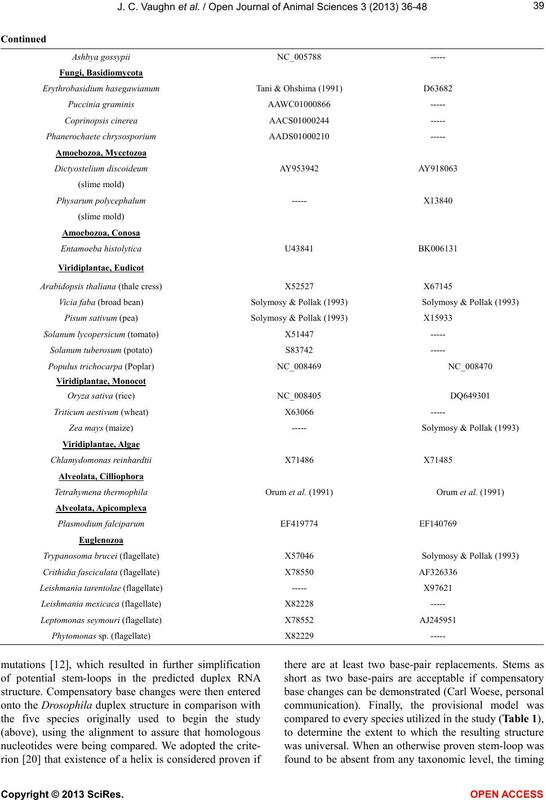 (a) H. sapiens; (b) S. cerevisiae; (c) T. thermophila; (d) P. falciparum; (e) D. discoideum; (f) A. thaliana; (g) C.
reinhardtii; (h) T. brucei. Labeling is as in Figure 1.
and in E. histolyt i ca, showing that it is not universal. this stem-loop onto the eukaryotic phylogenetic tree . but not in the Cilliophora T. thermophila. compensatory mutations present in this stem (Figure 1). three times (arrows) during evolution of these RNAs. the alignment must be utilized to create this structure. of contact is very different from that for other species. cations of this obser vat i on . diplomonad and p arabasalid g e nomes. been found (Steven Sullivan, personal communication). evolved within the flagellate group Euglenozoa. pected to be RNP-4F also binds to this stem-loop . that this dADAR protein is the truncated isoform . 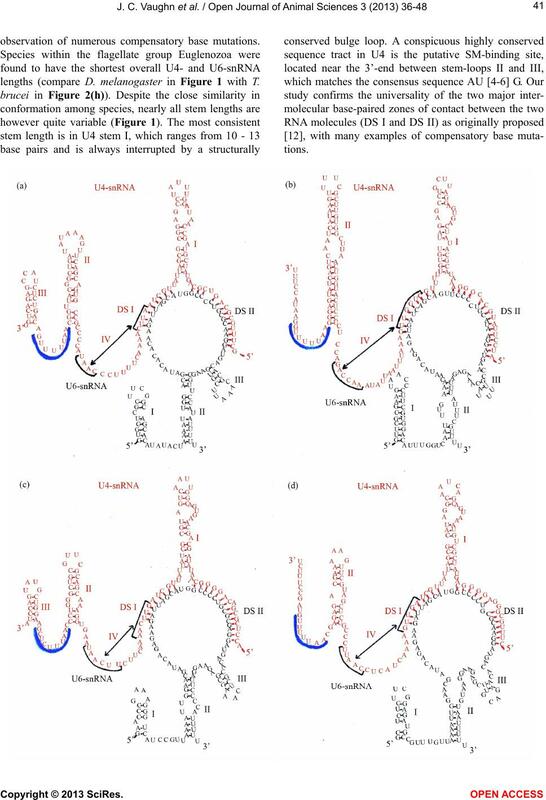 matic probing results on th e proposed human and yeast S.
and improved U4-/U6-snRNA secondary structure model. been traced to their origins within the phylogenetic tree. which may play a role in negative feedback control . help in constructing the secondary structure figures in the manuscript. (NIH) Grant 1-R15-GM070802-01 and 1-R15-GM093895-01 to J.
EST database searching. Nature Genetics, 13, 167-174. 4f-rnp locus. Gene, 204, 267-276.
spliceosomal intron losses create polymorphic alleles. 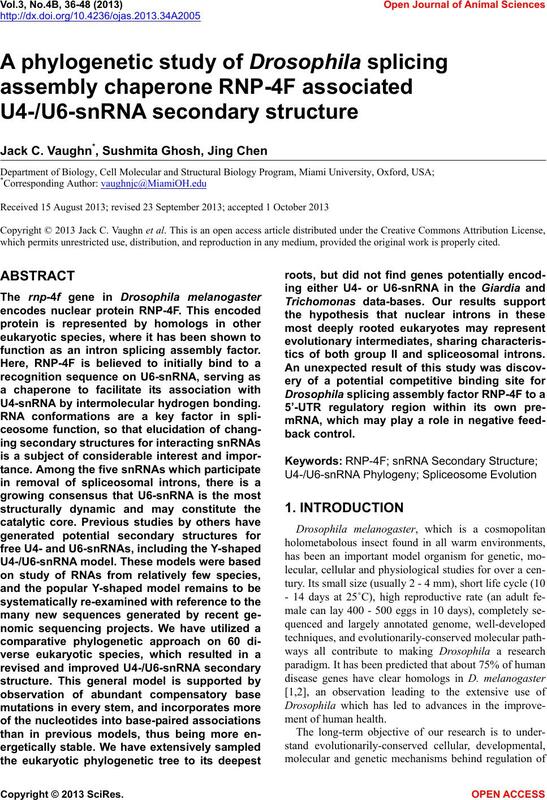 Journal of Molecular Evolution, 55, 401-413.
readthrough mRNA transcripts. 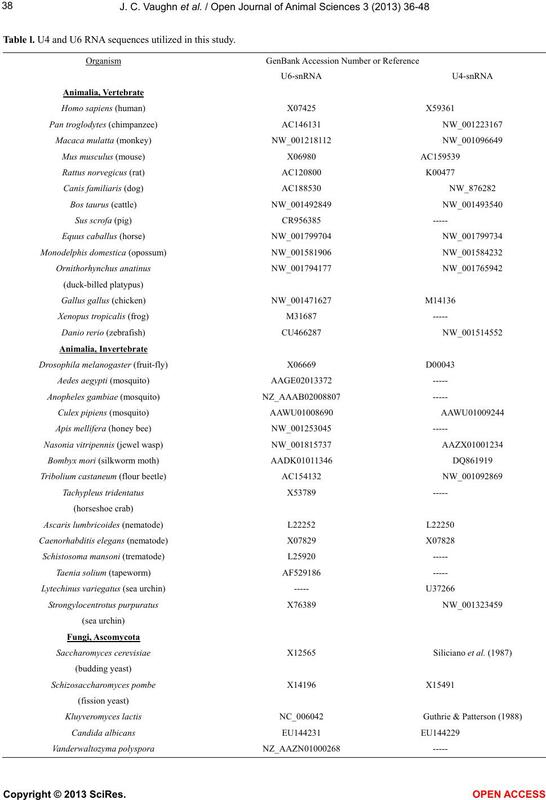 RNA, 9, 698-710.
sophila melanogaster. Gene, 399, 91-104.
di-snRNP formation. 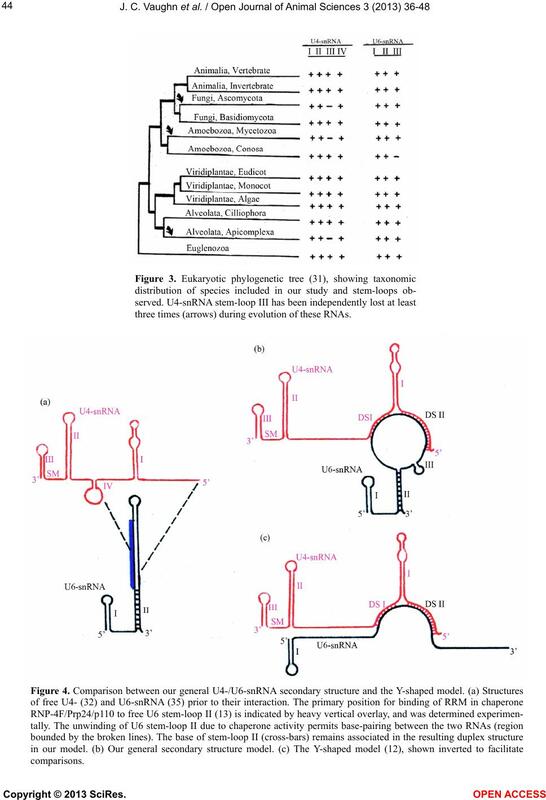 RNA, 8, 1378-1392. Karaduman, R., Fabrizio, P., Hartmuth, K., Urlaub, H.
Molecular Bi ology, 356, 1248-1262.
ratory Press, Cold Spring Harbor, New York, 369-400.
awash in a sea of proteins. Molecular Cell, 12, 5-14.
lent. 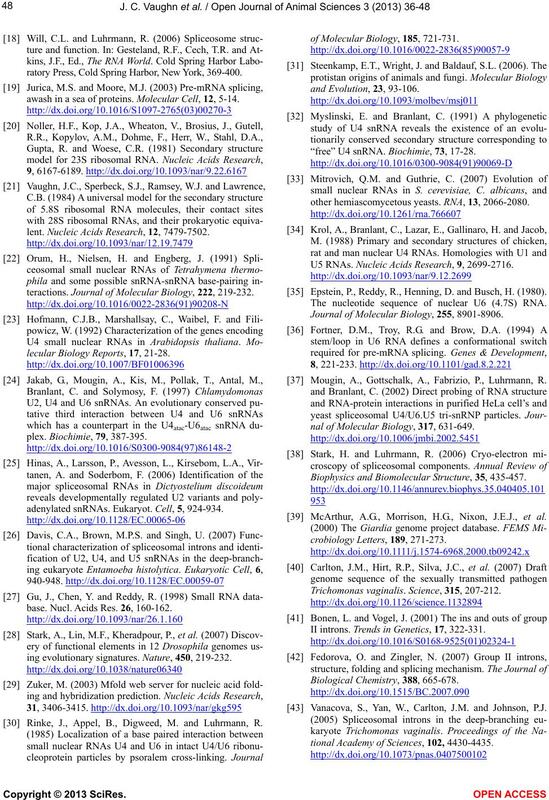 Nucleic Acids Research, 12, 7479-7502.
teractions. 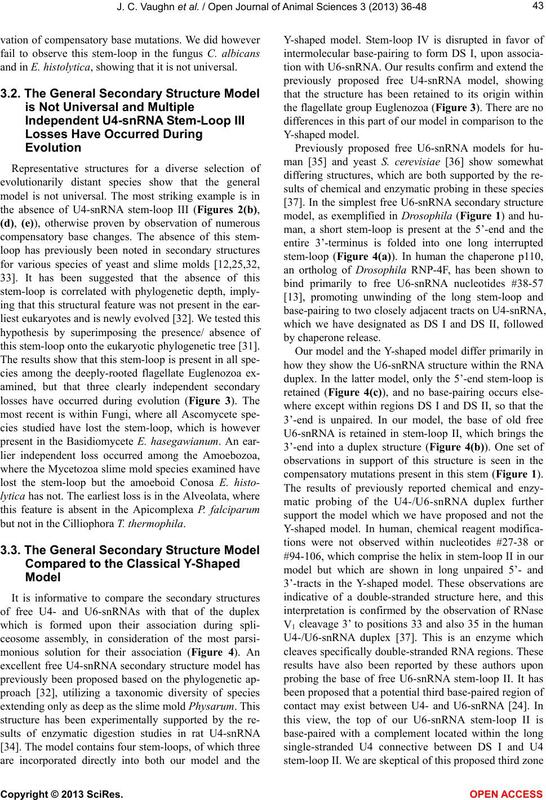 Journal of Molecular Biology, 222, 219-232.
lecular Biology Reports, 17, 21-28.
adenylated snRNAs. Eukaryot. Cell , 5, 924-934.
base. Nucl. Acids Res. 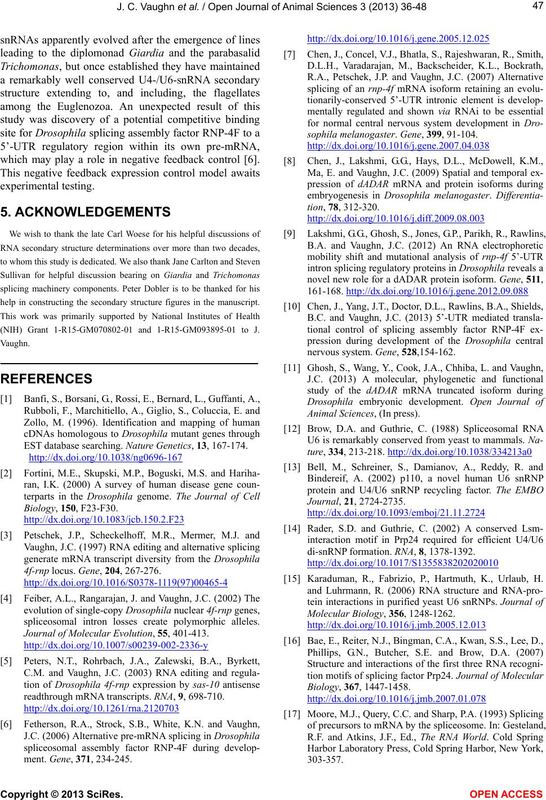 26, 160-162.
ing evolutionary signatures. Nature, 450, 219-232. Rinke, J., Appel, B., Digweed, M. and Luhrmann, R.
of Molecular Biology, 185, 721-731. 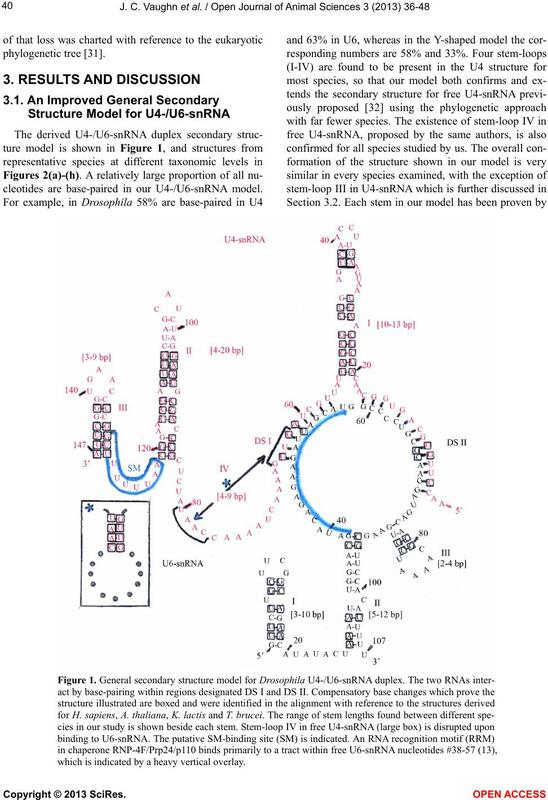 “free” U4 snRNA. Biochimie, 73, 17-28.
other hemiascomycetous yeasts. RNA, 13, 2066-2080. 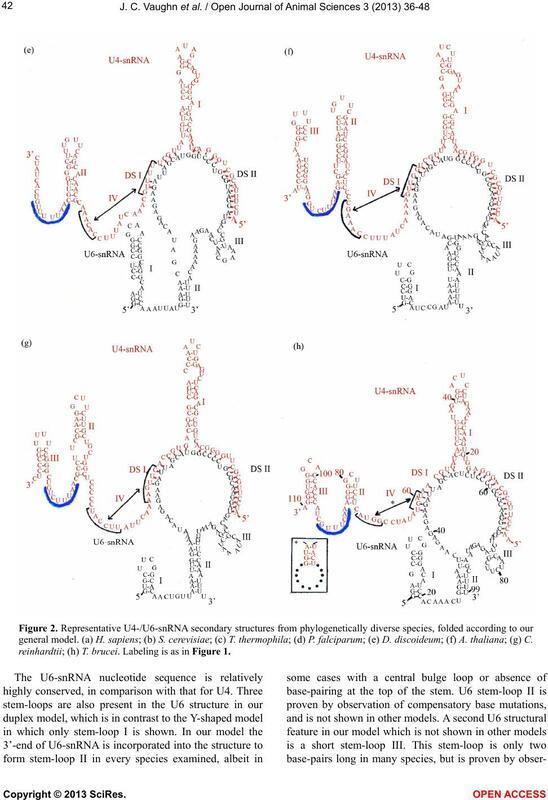 U5 RNAs. Nucleic Acids Resear c h, 9, 2699-2716. Epstein, P., Reddy, R., Henning, D. and Busch, H. (1980). The nucleotide sequence of nuclear U6 (4.7S) RNA. Journal of Molecular Biology, 255, 8901-8906. Mougin, A., Gottschalk, A., Fabrizio, P., Luhrmann, R.
nal of Molecular Biology, 317, 631-649. Biophysics and Biomolecular Structure, 35, 435-457. McArthur, A.G., Morrison, H.G., Nixon, J.E.J., et al. Trichomonas vaginalis. Science, 315, 207-212. II introns. Trends in Genetics, 17, 322-331. Vanacova, S., Yan, W., Carlton, J.M. and Johnson, P.J. tional Academy of Sciences, 102, 4430-4435.